No gift has stood the test of time more than a dozen beautifully scented, gorgeous, seductive Roses! 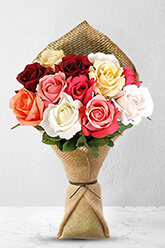 Show your love and romantic feelings with this captivating bouquet of short stem Roses in an attractive blend of assorted colours.Vase not included however; to add to the element of surprise, zFlowers.com recommends including a Premium Vase with your order. Beautiful roses ? ?and fast delivery. Excellent. We sent flowers to an elderly couple on their 60th wedding anniversary. Things are sad for them at present, but the flowers made for a happy moment in their day. Very good service, fast delivery, thanks.